The WAM construction team has been busy building boats for the Mieco Beach Yacht Club’s annual Recycle Can Race on the afternoon of Sunday, February 8, at the Marshall Islands Resort’s beach. This is often voted as the yacht club’s best event of the year. You come along and buy a boat for $5 and see if you’re America’s Cup material by competing in the elimination heats! 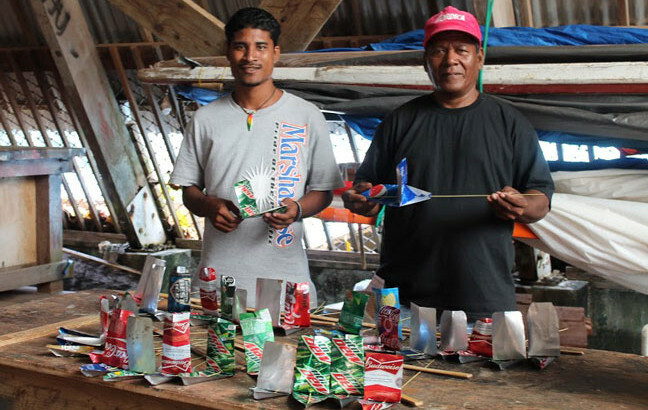 Pictured are Linton Baso and Binton Daniel with the newly-made boats, which earn WAM a nice bit of pocket money. Photo: Laura Masterson.